Lloyd's Ponderings: Positive talk to keep you going! I just flew back home to Florida from LA. I was out there shooting an episode of the Right Network new TV show, "Politics & Poker." I had a ball! The host of the show is Thomas F. Wilson, who played Biff Tannen in the "Back To The Future" movies. The concept of the show is fun. The set is designed to look like a basement family/game room. Tom invites his buddies over to play poker and discuss politics. I had the pleasure of meeting a great guy, renowned actor, Nick Searcy. You have seen Nick in a ga-zillion movies. He is currently starring on the FX series, "Justified." Nick was one of us five poker buddies on the "Politics & Poker" show. Once back home in Florida, rather than diving into answering emails and dealing with stuff, Mary and I decided to spend the day at our favorite, New Smyrna Beach. The sand was soft under foot and the water was clear and beautiful. The heat from the bright sun was countered by an occasional breeze across the ocean. Beach bathers kept staring at us. Most smiling. A few stone faced. Then, it dawned on me. 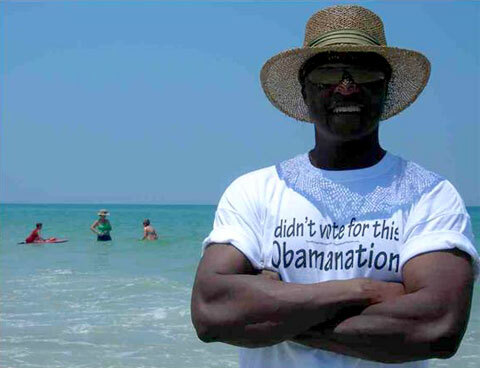 I was wearing my, "I didn't vote for this Obamanation" t-shirt. We fed "Cheetos" to the seagulls. What a great relaxing day. Life is good.